+ How long does the NutriDrip infusion take? The drip will usually take 30 - 45 mins depending what package you get and big your veins are. + How often can I get a NutriDrip? 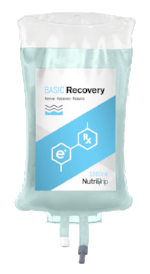 While it is safe to get daily nutridrips for their health benefits, we generally limit our customers to 1 drip every 3 days. + What is in a Nutridrip? IV Fluids: We mainly use Lactated Ringer's (electrolyte charged hydration) because it's the most effective at rehydration. Becuase we use the highest quality medical supplies, and industy best IV vitamins volumes, and the best medical professions, the costs add up. Currently, we only offer in home/office/hotel service which requires one of our highly skilled registered nurses to come to you. This means you get a personal medical professional for around an hour (plus travel). This service would cost 3x in a doctor's office and $1000's in a hospital. Don't see your question here? Shoot us an email at contact@hangoverclub.com and we'll get right back to you! Does IV hangover therapy really work?